摘要 目的 探讨涟水县改水前后细菌性痢疾（简称菌痢）发病情况及其流行规律.方法 收集涟水县1970-2012年菌痢报表数据和人口学资料,采用集中度和圆形分布法分析改水前（1970-1987年）、初步落实改水阶段（1988-2000年）、全面落实改水阶段（2001-2012年）菌痢发病情况、季节性、高峰日、高峰期和流行期等指标.结果 43年间累计报告菌痢患者25 398例,年均发病率为63.04/10万,初步落实改水阶段年均发病率比改水前下降了42.01％,全面落实改水阶段比初步落实改水阶段进一步下降了51.92％.无论改水前后,菌痢发病均具有较强的季节性（集中度M值介于0.5～0.7）,发病高峰时点在夏季的7月31日,高峰期为6月2日-9月26日,流行期为4月7日-11月21日.随着改水的逐步落实,菌痢高峰日、高峰期和流行期也逐渐往前推移,3个阶段高峰日分别为8月9日、7月25日、7月15日.结论 涟水县细菌性痢疾发病有较强的季节性,应于每年的4月前做好防制准备,夏秋季时进一步强化防疫措施. Objective To discuss the incidence and epidemiological characteristics of bacterial dysentery before and after wa- ter improvement in Lianshui County. Methods The bacterial dysentery report data and demographic data in Lianshui county were collected from 1970 to 2012. Concentration ratio method and the circular distribution melhod were used to analyze the in- cidenee, seasonality, peak day, peak and epidemic period in 3 stages： before water improvement（1970-1987）, preliminary stage of water improvement（1988-2000） and full implementation stage of water improvement（2001-2012）. 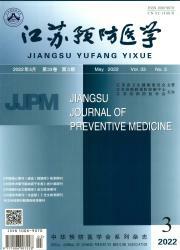 Results Totally 25 398 bacterial dysentery cases were reported during 43 years, annual incidence was 63.04 per 100 000. The annual incidence during the preliminary water improvement stage was decreased by 42.01% compared to that before water improvement. The annual incidence during the full implementation stage decreased further 51.92 % compared to preliminary stage. The bacterial dysentery showed apparently seasonality （concentration ratio M=0. 5-0. 7） before or after the water improvement. The peak day was July 31^st , the peak was from June 2na to September 26th , and epidemic period was from April 7^th to November 21^st. With the implementation of water improvement, the peak day, peak and epidemic period shi：Fted earlier gradually. The peak days of three stages were August 9th , July 25th and July 15^th , respectively. Conclusion The bacterial dysentery showed appar- ent seasonality in Lianshui County. Prevention and control measures should be taken before April every year with further strengthening in summer.